The presence of a wheeze implies narrowing of airways of any size throughout the proximal conducting airways. Wheezing occurs during the prolonged expiratory phase. Children wheeze more often than adults because of physical differences. 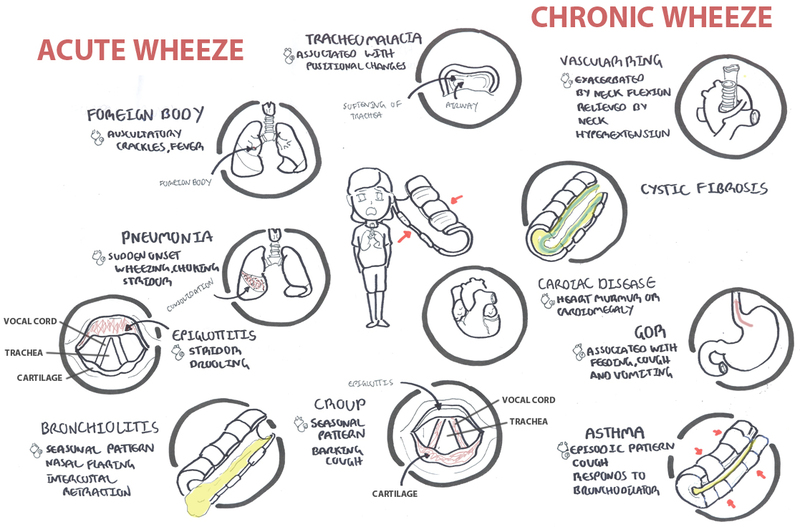 Overview Wheezing in infants and children is a common problem presented to primary care offices. Approximately 25 to 30 percent of infants will have at least one episode of wheezing. The presence of a wheeze implies narrowing of airways of any size throughout the proximal conducting airways. 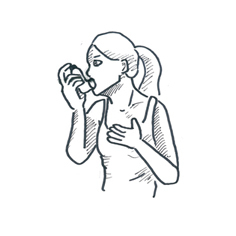 A wheeze requires sufficient airflow to generate the sound of a wheeze. Most infants and children with recurrent wheezing have asthma, but other causes should be considered in the differential diagnosis. Beware of the wheezing patient who suddenly becomes silent. Occurs during the prolonged expiratory phase by the rapid passage of air through airways that are narrowed to the point of closure. Infants’ and young children’s bronchi are small, resulting in higher peripheral airway resistance → diseases that affect the small airways have a proportionately greater impact on total airway resistance in infants. Infants also have less elastic tissue recoil and fewer collateral airways, resulting in easier obstruction and atelectasis. The rib cage, trachea, and bronchi are also more compliant in infants and young children, and the diaphragm inserts horizontally instead of obliquely. Remember Beware of the wheezing patient who suddenly becomes silent. Serum immunoglobulin levels – Immunodeficient? Barium swallow – may detect vascular rings and esophageal compression. Computed tomography – can identify lung nodules and bronchiectasis, but these are uncommon causes of wheezing in children.